The nuclear chain begins with uranium mining, a polluting activity that devastates large areas. Uranium ore can contains as little as 500 grams recoverable uranium per million grams of earth. 3 Enormous amounts of rock have to be dug up, crushed and chemically processed to extract the uranium. The remaining wastes, still containing large amounts of radioactivity, remain at the mines. These "tailings" are often stored in a very poor condition, resulting in the contamination of surface- and groundwater. The same process used to make reactor fuel can be used to highly enrich uranium for nuclear bombs. This is why nuclear power programs have led to nuclear weapons programs in other countries. Many steps are required to make uranium suitable for use in nuclear reactors. From mining to milling to conversion to enrichment to fuel fabrication, each step involves separate facilities throughout the U.S. poisoning communities with radioactive and chemical pollution (mostly in western and mid-western states). Strontium-90, a radioactive pollutant now released only from nuclear reactors, ends up in milk and bones, contributing to bone cancer and leukemia. Studies of Sr-90 in baby teeth found levels 30-50% higher in teeth of children living near reactors.11 Background levels are rising with continued use of nuclear reactors, rising to levels comparable to when atmospheric nuclear bomb tests contaminated the nation in the 1940s and ‘50s. Levels in the teeth of babies born in the late 1990s are about 50% higher than those born in the late 1980s. 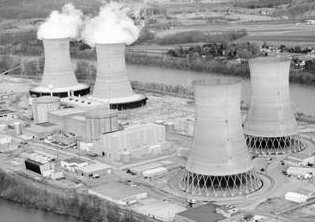 Of the 7 areas examined so far in the baby tooth studies, the highest Sr-90 levels have been found in southeastern PA – around the Limerick reactor. Living near reactors is also correlated with increases in leukemia and childhood cancer. Reactors require huge amounts of cooling water, which is why they’re often located near rivers, lakes or oceans. Reactors with cooling towers or ponds can use 28-30 million gallons of water per day.12 The 48 reactors with once-through cooling systems use far more (up to 1.5 billion gallons per day). A typical two-unit reactor using once-through cooling takes in about a square mile of water, 14 feet deep, each day. An equally huge volume of wastewater is discharged at temperatures up to 25 o F hotter than the water into which it flows. Indigenous marine life suited to colder temperatures is eliminated or forced to move, disrupting delicately balanced ecosystems. Radioactive wastes are produced continually in reactors. There are two basic types of nuclear waste: high-level nuclear waste (the used fuel rods) and “low-level radioactive waste” (everything else). High-level nuclear waste (also called irradiated or “spent” fuel) is literally about one million times more radioactive than when the fuel rods were loaded into the reactor. This waste is so lethal that standing near it without shielding would kill you within minutes. This waste will be hazardous for millions of years. No technology exists to keep it isolated this long. Irradiated fuel rods are stored in storage pools inside reactor buildings, often several stories high, where they’re highly vulnerable to aircraft attacks.14 If the water is drained from the pool, exposing the rods to open air, a meltdown would cause a massive release of radiation. Some utilities have begun storing this waste in dry casks on outdoor concrete pads in the backyard of the reactors, introducing separate storage, packaging and security problems. Nuclear power is the most expensive form of power and could not exist with massive subsidies, including the “Price-Anderson” law that places a cap on industry liability in the event of a nuclear accident. Fusion still produces nuclear waste, including tritium, a very dangerous, hard-to-contain air and water contaminant.18 Like fission, it would be very expensive and highly centralized. Despite massive research spending, it’s still decades away from reality. The same money spent on clean solutions (conservation, efficiency, wind and solar) would do far more. Joseph Mangano. Low Level Radiation and Immune System Damage. Published by CRC, July 29th 1998. Citizen Alert and Deniis Weber, Ph.d and Earle Dixon, M.S. Analysis of the Nevada Test Site Early Warning System for Groundwater Contamination. March 2004. http://www.clarku.edu/mtafund/prodlib/citizen_alert/Citizen_Alert_of_Nevada.pdf A summary report available at http://www.h-o-m-e.org/Legacy/LegacyDocs/NTS%20water%20summary%20report…. Also see, Plutonium Found in Water at http://www.gdr.org/putoniumfoundinwater.htm September 1997.